6 simple ways to mix and match basic moves to create 20-40 minute circuits. Each exercise on its own activates several muscle groups for a greater metabolic challenge. By stringing these moves together you amplify the fat burning benefits. These circuits develop lean muscle, raise your heart rate to burn maximum calories, strengthen your endurance and increase the after burn to torch calories post work out! Stand with feet shoulder width apart and hold a set of dumbbells, arms by your sides. sit back into a squat until thighs are nearly parallel to the floor. Then press through your heals to straighten your legs and jump of the ground. Immediately lower into the next Rep. Stand feet slightly wider then shoulders and toes turned slightly out. 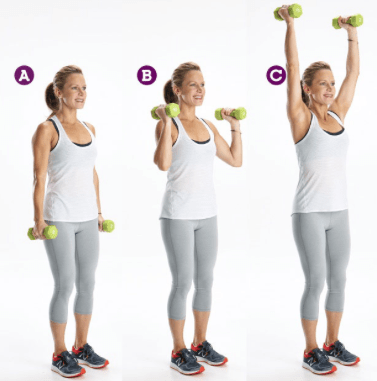 Hold a dumbbell in each hand at shoulder eight, palms Facing each other. bend knees and sit back until thighs are parallel to the floor. Push your pelvis forward as you stand and extend your arms pressing the weights overhead. Slowly reverse the movement to immediately lower into the next rep.
Holding a pair of dumbbells, palms facing your thighs, shift your weight onto your left foot. keeping a soft bend in your knee hinge forward from your hips, Lowering your torso toward the Floor while extending your right leg Behind you. slowly reverse the move to return to start, keeping the weight close to your body the entire time, Finish all reps then switch sides. Hold dumbbells in each hand and get into a pushup position. Brace your core and squeeze your gluten, then bend your left elbow to raise the weight to the side of your chest, Keeping hips parallel to the floor. Slowly lower back to start then repeat on the other side. Start in a push up position, hands shoulder width apart. Bend our elbows to lower your chest toward the floor. press back up to start, rotating you body to the left and raising your right arm toward the ceiling. Return to start. alternate sides with every rep. 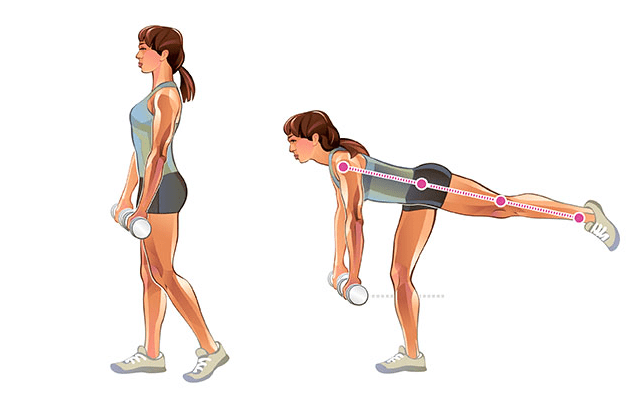 Hold a dumbbell with both hands and stand with feet slightly wider then shoulder width. knees slightly bent. hinge forward at your hips to bring the weight between your legs. squeeze your gluten and thrust your hips forward and swing the weight to shoulder height, arms straight. reverse the moment, bringing the dumbbell between your legs, continue shining back and forth . Lie face up with arms extended overhead. in one motion, brace your core and raise your left leg as you reach your hands toward your toes. Slowly lower leg and arms to return to start, repeat on the other side. Holding a pair of dumb bells, arms at your side,palms facing each other, stand with feet together slight bend in the knee. Keeping your chest tall,bend your left elbow to bring the weight to your shoulder. then extend your left arm to press the dumbbell directly over your left shoulder.reverse the move to return to start finish all reps and switch sides. With your feet hip width apart, sit your hips back and bend your knees, placing your hands on the floor in front of you. Jump your feet back into a pushup position. Quickly reverse the moment, press through your heels and rain your arms overhead to jump off the ground, land softly and repeat the move. .Standing with feet together, bend your knees and push off your left foot to jump to the right, crossing your left leg behind your right and reaching your left hand toward the floor as you land softly on your right foot. quickly push off your right foot and jump to the left. switching your arms and legs. continue hoping back and forth as quickly as possible while maintaining balance and count. Start in a pushup position, hands shoulder width apart and your back in a straight line from head to heels. keep your backlit and upper body still, draw your right knee toward your chest, quickly switch legs. continue alternating. Your go to 40 Min Circuit to strengthen every muscle from your shoulders to your calves, while getting your heart pumping for the cardio Benefits. When you want a burn, but you are short on time, give this 20 min work out a go. *Use your heaviest weights, no resting in-between moves. Once you have gone through all moves, 6 reps each per side, Rest for 2 min, then repeat for a total of 4 rounds. This will get your heart pumping and burn an average of 200 calories in just 24 Minutes. *Use light weights, perform each move for 40 seconds each in sequence ( alternating sides where applicable). Rest 20 seconds between each move.Repeat for Three rounds total. No Weights? No Problem! Use your Body weight in this 10-25 minute circuit( depending on your speed). *Do each move for the assigned number of reps ( No weights) in order as fast as you can, Rest 30 seconds and repeat two more times. *Use heavy weights. Crank out the assigned number of reps for each move in order. Do as many rounds as possible in 5 minutes. *Do each move as fast as you can , with out stopping between moves. rest for 30 seconds, then repeat the entire round once or twice more.